The Salus project was originally set up to search & recover Hilen Tukoss after we received the messages from both the fake & real Hilen Tukoss. But this search turned out to become much more then anticipated. Through the intensive search for the Arek'Jaalan founder, we stumbled on alot of new discoveries. From shattered wormholes to strange Drifter structures. Hilen Tukoss himself disappeared several years ago, when he wanted to find out what happened to Lianda Burreau after her ship was found inside the wormhole system J105934 along with a piece of Trinary data aboard, a Jove relic. She and her team were one of the first to travel into wormhole space as an assignment from Creodron. Shortly after she broadcasted the discovery of a new civilisation (Sleepers) she vanished & was presumed lost. Almost a year ago, we received messages from Hilen Tukoss, who disappeared a few years prior as he was investigating the wormhole systems. It was quickly discovered that there were two broadcasters identifying themselves as him. The first messages were from an entity that pretended to be Hilen Tukoss, in a successful attempt to acquire Jove body parts. The latter messages are believed to be from the real Hilen Tukoss. These messages lead to the creation of Project Salus, to search for Hilen Tukoss & discover what is going on. From the little info collected, it was determined he was held captive in a wormhole system. Initially, the search for Hilen Tukoss didn't got alot of priority, until the Caroline Star event, that set in motion an avalanche of events, from the Seeker's arrival to the discovery of many new wormholes. These major changes turned Project Salus into a priority, as it was believed that Hilen Tukoss had acquired crucial data during his captivity. For many months, dozens of capsuleers scouted wormhole systems, in search for clues. During this they mapped out the shattered wormhole systems, discovered the Sansha staging grounds embedded deep in wormhole space. Diplomatic contact with the Drifters and Seekers was also attempted, hoping to appeal to them for clues on Hilen Tukoss' whereabouts, but to no avail. despite all the efforts people put in it, it was as if we were chasing a ghost. Despite the many discoveries made during the Salus Project, we didn't seem to get closer on finding the Arek'Jaalan founder. But the release of a disturbing recording that was leaked to Scope put the search in overdrive, as it depicted a massive gathering of Drifter battleships & was voiced by Hilen Tukoss. Shortly after this announcement, it was discovered that the Drifter wormholes could be traversed. The reason for this is unknown, as the Drifters still fire on anyone approaching their wormholes, so we're clearly not wanted in there. At long last, the corpse of Hilen Tukoss was found as reported by the Scope. In a public announcement by Makoto Priano, it was revealed that his body was found in a newly discovered wormhole system, occupied by the Drifters. 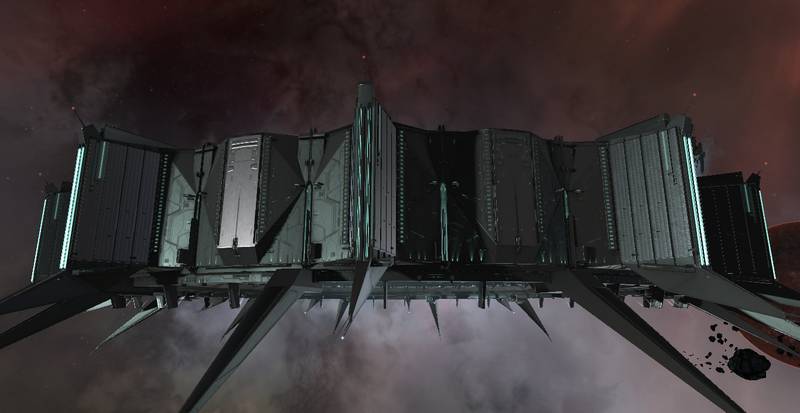 Alongside his corpse was also the presence of an immense structure, a Drifter Hive structure! Initially this fine group of explorers were honored by the DED for their dedication & the retrieval of his biomass. However, the situation turned sour rapidly after Concord announced they would sanction these capsuleers if they did not turn over the recovered biomass. They were even willing to put hefty bounties on them & sanction their corporations! Such heavy handed threats towards capsuleers are a rare occasion & made many a capsuleer frown. Especially because in a later public statement, the involved capsuleers stated they wanted to cooperate as much as they can, without surrendering critical pieces of evidence to Concord, preventing them to take their usual 'We don't reveal information' policy. Shortly after this announcement, negotiations went smoother, allowing Concord to confirm the remains were indeed Hilen Tukoss. In an public release, Concord officially confirmed the death of Hilen Tukoss by Transneural Brun Scan Failure, a rare occurrence where the neural transmitting from the capsuleer clone to the new clone body fails due to an error in the burning process. This left Eifyr & Co to execute the last will of the deceased Hilen Tukoss & send his corpse to Piekura, for a proper burial at his homeground. To honour his achievements & pay respect, capsuleer Dutchgunner organized a Memorial service that drew in a large crowd who all wanted to pay last respects to Hilen Tukoss. Despite all the above, the search for Hilen Tukoss continues as some believe he had a backup system ready for something like this. This would be unlikely, as the analysis has revealed that the burn process itself did not ru n like it should, indicating a high risk on permanent damage for memory data transfer. Another speculation is that Hilen Tukoss still lives on in a digital form aboard a Sleeper or Seeker ship but that he's not fully aware of this aspect. This speculation find ground in the decrypted message where he announces he would head towards Site One and urges capsuleers not to shoot on Sleeper/Seeker ships as he would be flying one. So far no Seeker has been sighted on Site One with odd behaviour, or a Sleeper ship, yet various capsuleers keep an eye out for his arrival, just in case. It's also possible that this search will never come to a satisfying conclusion, but that does not need to be a bad thing. So far, the search for Hilen Tukoss yielded a ton of information & made staggering discoveries, like the Drifter Hive structures in the newly discovered wormhole systems.